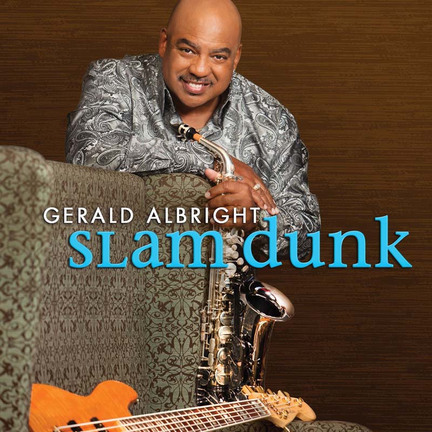 On his latest disc, Gerald Albright offers a high-energy contemporary jazz set that puts the veteran saxophonist’s dizzying array of talents amply on display. Not only does the album showcase Albright’s formidable skills on alto, soprano, tenor and baritone sax, it also demonstrates his facility on flute, bass and vocals, as well as his talents as a composer, producer and arranger. Stylistically, Albright stays on familiar terrain, not venturing far from his trademark R&B-flavored sound, but the tunes on the album are so likable, and so energetic, that they draw you in and keep you interested. The title track, which opens the disc, sets the tone. An ebullient urban-jazz number, it features punchy horns, a muscular alto sax lead and some very funky bass from Albright. The saxophonist played in Phil Collins’ 1998 Big Band project, and on Slam Dunk he tips his hat to his former bandleader by covering “True Colors,” a hit for both Collins and Cyndi Lauper. Both pop stars recorded the song as a ballad, but Albright’s version-which features background vocals by the saxophonist and his daughter Selina-picks up the tempo a bit, pairing a peppy alto lead with a midtempo groove.